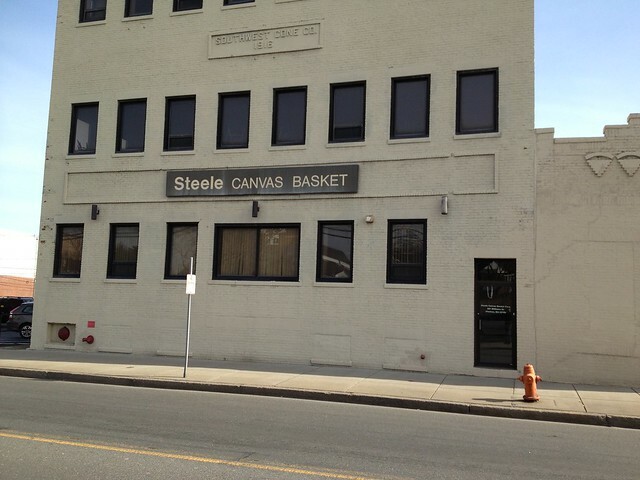 Last week I had the opportunity to tour Steele Canvas Basket in Chelsea, MA with Director of Marketing, Frank Geffken. Everyone knows (whether you realize it or not) about this company. You’ve seen the large trucks in hotels, on college campuses, the post office….they are everywhere all over the country supplying every industry. The recognizable old school STEELE logo is still hand stenciled on almost every item. 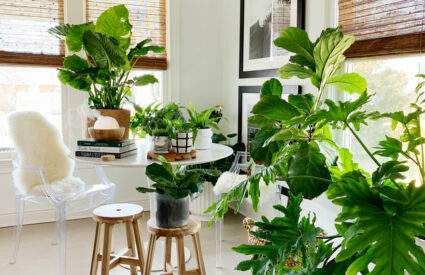 The company has been in business since 1921 and has been supplying industries with durable products like the industrial trucks and baskets and in recent years they have been meeting the demands of homeowners who want these items for laundry rooms, mud rooms, play rooms and the garage. 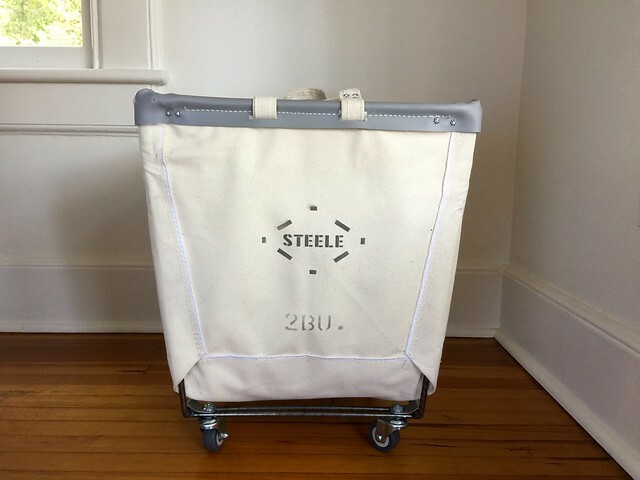 Whether the items are being used on construction sites or in someone’s laundry room…Steele’s products are built to last. They have been made the same way (by hand in their factory in Chelsea, MA) for almost a century. They try to source the materials in the United States. For example, the wood slats for the construction of the large trucks come from upstate New York. 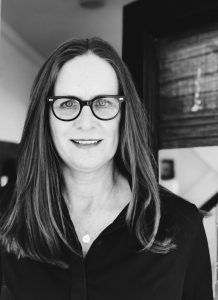 The last several years this family-run business has been collaborating with companies like J.Crew, Crate & Barrel, west elm and Anthropologie to bring their products to the public for the same reason commercial industries have been using them for years. Quality and durability. 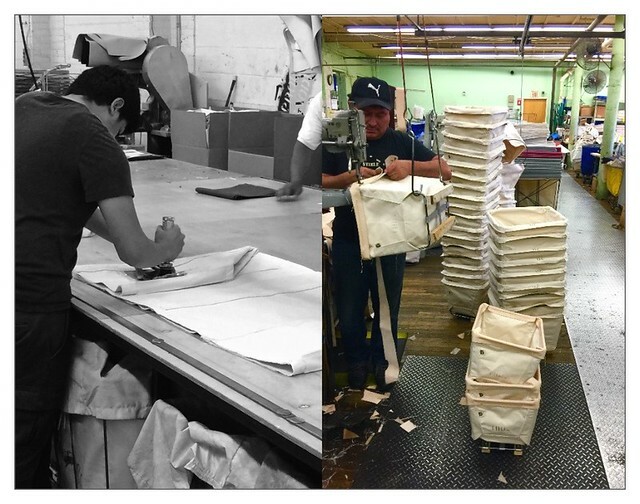 When time allows, the team tries to produce a new bag a month. They meet and discuss what they would want in a bag and come up with new products that their customers will appreciate. 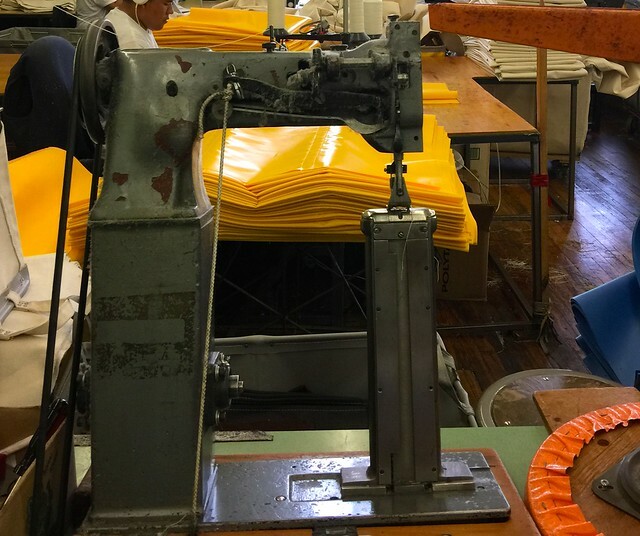 I loved actually seeing how these products are made from start to finish. 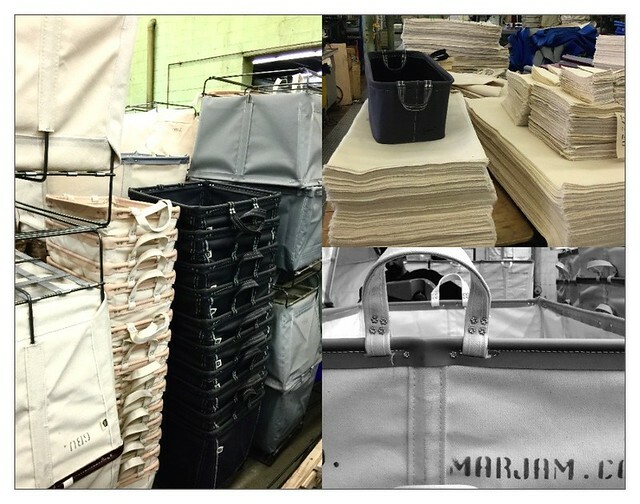 How the fabric is cut (with very little waste) and constructed into the products that will stand the test of time. “A guarantee is better than a warranty any day of the week.” There is so much detail and quality control that goes into each item before it goes out the door that it’s no wonder they have been in business since 1921. In May the company brought back the iconic Steele Sling Chair also known as the butterfly chair. It was first introduced in the 1960s and just recently brought back into production. 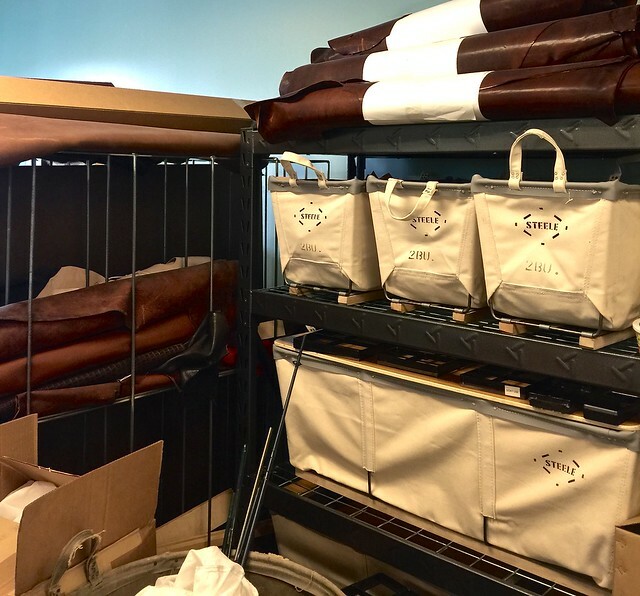 Of course they use high quality materials like powder-coated hand bent and welded steel frames and industrial grade duck fabric slings that are available in several colors. 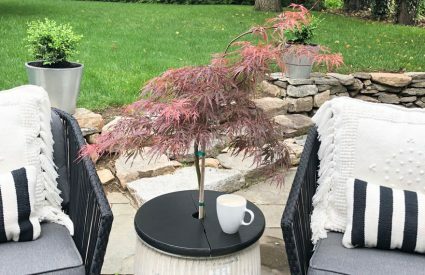 Buying a chair or any one of their products feels good to know that you have an item that will stand the test of time in both design and durability. Thank you Frank for taking time to show me around the company and letting me see first hand how companies used to make things and how it’s still being done at Steele Canvas Basket, 201 Williams Street, Chelsea, MA. Hi Annie! How cool, that you got take a tour of Steele. I recently got some of the charcoal grey baskets from rejuvenation and I love them, perfect movable toy box! I’m now planning on some built-ins around some Steele baskets. Hope you’re well, friend! I would LOVE to see your project when it’s done! I love those charcoal gray baskets! Very cool! Love old school companies who keep doing it the right way. Made in the USA!!! Woohoo!! Oh my gosh Annie! How did you get THAT hookup! How amazing. I love their baskets. Lucky girl, thatnks for sharing! I bet they made the butterfly chairs that I just saw at The Parker in Palm Springs…so cool. 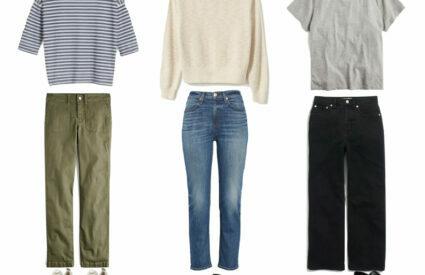 I like everything they make. Thanks for the tour.